Civicom, leading innovative marketing research facilitator, is a featured commentary writer in the 23rd edition of the GreenBook Research Industry Trends (GRIT) Report. The GRIT report is a comprehensive and exploratory map of the insights industry, covering the most up-to-date topics crucial in the progress of insight research and discovery. From data collected in the first two quarters of 2018, the latest edition produced by GreenBook tackles market research sampling, drivers of spending, automation, GDPR readiness, and the industry perception on blockchain. As an innovative provider of global marketing research services, Civicom continues to be at the forefront of recognizing and developing the potential of technology to enhance market research process. In 2017, Civicom participated alongside a panel of industry experts in a discussion on market research trends and game changers. One of the major takeaways from the 2017 survey conducted by GreenBook is the transformative role of technology and how it has become a significant know-how for insight professionals. 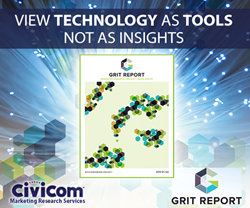 In Civicom’s commentary in the latest edition of the GRIT report, Rebecca West, Global Vice President of Marketing Research Services, re-emphasizes the importance of adapting digital transformation in enhancing the market research process: “Researchers have no choice but to embrace technology if their businesses are to remain relevant,” she writes, but reminds researchers that innovative tech solutions “does not negate the research process.” Civicom also stresses that “It is important to see technology as tools, not as insights.” At the end of the day, the researcher’s skill set involving sound methodology, solid recruiting, and analytics remain invaluable elements in a successful study. Civicom’s commentary can be read in full in the latest edition of the GRIT report, now available for download via GreenBook’s website at https://www.greenbook.org/grit. The GreenBook Worldwide Directories is a project of the New York AMA (American Marketing Association) Communication Services, Inc., a wholly owned subsidiary of the New York American Marketing Association. GreenBook provides a listing of market research suppliers in two volumes. Volume One features companies that offer online advertising, brand and media research, and specialized research for major industries like financial, healthcare, retail, technology and telecommunications. The second volume features companies that offer focus group moderation, and qualitative research services such as recruiting, moderating, videoconferencing, internet broadcasting, usability testing, etc. The GreenBook onine directory can be found at https://www.greenbook.org/. Civicom Marketing Research Services offers many options to enhance the research process for marketing research professionals. Civicom is the global leader in facilitating telephone and web-enabled IDIs and Focus Groups using Civicom CyberFacility®. Civicom also offers Civicom Chatterbox®, an asynchronous research platform for online communities and bulletin boards, plus the Civicom ThoughtLight™ Mobile Insights App, a mobile qualitative tool for collecting richer in-the-moment insights, offering geolocation plus offline accessibility for places where there is no data connection. Civicom ThoughtLight™ works with both iOS and Android and is a useful tool for shopper insights, audio diaries and patient journeys. Civicom operates in over 96 countries and offers extensive translation services for marketing researchers, as well as transcription services through TranscriptionWing™, and respondent recruiting through CiviSelect™. All of these services are available in Spanish, as well as English, and multiple other languages. Civicom Marketing Research Services chooses to be as dynamic as it is innovative; always listening to and acting on clients’ ideas and requests as they see fit. This kind of relationship has paved the way for the development and roll-out of new services. To learn more, email Civicom® at inquire(at)civi(dot)com or call +1-203-413-2423.